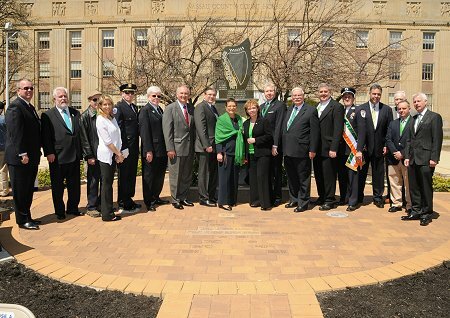 (Mineola, NY) The Irish Monument Committee and the Brehon Law Society of Nassau County recently hosted the Annual Easter Monday Commemoration ceremony at the County Court House in Mineola. Each year at 12:00 noon, on the Monday following Easter, a commemoration ceremony is held to remember the Irish Easter Rising of 1916 and to honor the memory of those who have struggled for human dignity, human rights, and Irish unity. At this year’s commemoration ceremony, Nassau County Clerk Maureen O’Connell joined other area officials and community members in honoring those who have advanced the causes of peace with justice in a united Ireland. Prominent members of the Irish community assembled with pipers and poets at the commemoration of this historical event.